iTunes Store gift cards have been popping up in more places than milk and sliced bread in recent years, but if your loved one is an avid Android enthusiast that easy, versatile present idea goes out of the window. Thankfully Google has remedied the ill preventing our generous gestures and (those of our own friends and family members) by bringing Google Play gift cards to the UK. The cards, which can be used to purchase anything on the Play Store (apps, music, movies, books, magazines, etc.) have gone on sale for £10, £25 and £50. Right now they're only available in selected Tesco's and Morrison's branches and will be rolling out to all of their locations around the UK in the coming weeks. 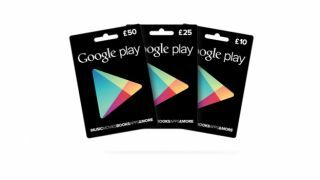 The UK launch follows the debut of Google Play gift cards in the United States back in August. It seems likely that if they prove a hit with UK shoppers, then we'll soon be seeing the vouchers competing with iTunes for all manner of shelf space at a wide range of stores across the nation.